Intertwine was a collaborative, large-scale yarn-bombing of the façade of ISU Design on Main, a community gallery in the Main Street Cultural District in downtown Ames, Iowa. 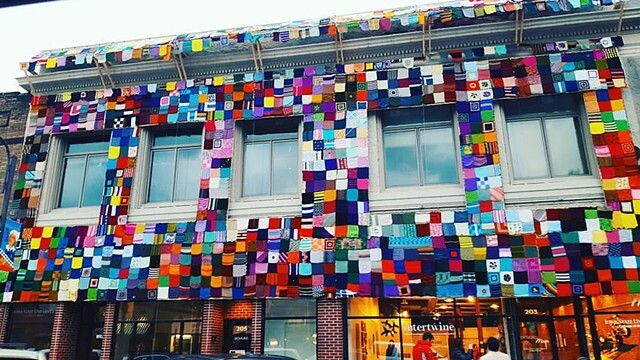 Over 1200 1’ x 1’ panels were designed and created by the public: knitters from 14 states across the country to collaborations of existing knitting circles in Iowa and groups located in Ames. Throughout the year, Design on Main hosted free workshops and fiber circles to support the project and encourage community building. Post-installation, the panels will be transformed into larger 4’x8’ blankets to be donated to local shelters in central Iowa. This project was supported in part by grants from Burning Man, the Iowa Arts Council and National Endowment of the Arts, as well as funding from ISU's College of Design.